This belonged to my grandfather. It had only had one owner. It is from the 1950s from what I understand. 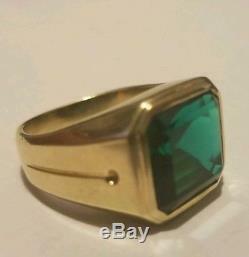 It is 14k gold emerald cut emerald men's ring. It has an engraving inside that says ksk 14k. Item was appraised recently at 750. 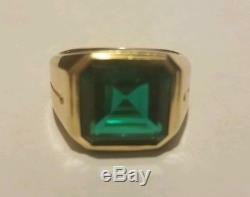 The item "Men's Emerald Cut Emerald 14K GOLD SZ 10.5 KSK VINTAGE 1950S" is in sale since Friday, August 3, 2018. This item is in the category "Jewelry & Watches\Men's Jewelry\Rings". The seller is "alerud_3" and is located in Atlanta, Georgia. This item can be shipped to United States, Canada, United Kingdom, Denmark, Romania, Slovakia, Bulgaria, Czech republic, Finland, Hungary, Latvia, Lithuania, Malta, Estonia, Australia, Greece, Portugal, Cyprus, Slovenia, Japan, Sweden, South Korea, Indonesia, Taiwan, Thailand, Belgium, France, Hong Kong, Ireland, Netherlands, Poland, Spain, Italy, Germany, Austria, Israel, Mexico, New Zealand, Singapore, Norway, Saudi arabia, United arab emirates, Qatar, Kuwait, Bahrain, Croatia, Malaysia, Chile, Colombia, Costa rica.